Competing on the international stage, the male defensive player has become an increasing rarity; yet at the forthcoming China Construction Bank 2018 ITTF Europe Top 16 Cup, to be staged the Swiss city of Montreux on Saturday 3rd and Sunday 4th February, the names of Panagiotis Gionis of Greece and Germany’s Ruwen Filus both appear. It is the first time in the history of the tournament, the initial event being staged in 1971 in Zadar and held every year since that date, with the exception of 2013, that two primarily backspin players have appeared in the Men’s Singles event. It has taken 47 editions for the phenomenon to occur. Notably for 29 year old Ruwen Filus, it is his debut in the competition, an appearance which supports the oft repeated theory that the defensive players matures rather later than the attacking top spin exponent. Somewhat similarly, for 38 year old Panagiotis Gionis, a player from one generation earlier, Montreux will be his fifth appearance and his fifth in succession. It was not until 2014 when the tournament was held in Lausanne that he made his first appearance; at the time he was 34 years of age, the maturity theory for the defender again having some value. Furthermore, of the male defenders who have competed over the years, alongside Austria’s Chen Weixing, Panagiotis Gionis is the most successful. In 2015 in Baku, he reached the semi-final round, a feat Chen Weixing achieved in 2010 in Düsseldorf in his ninth and to date concluding appearance in the competition, having earlier advanced to the same round in 1999 in Split. Otherwise for male defenders it has been meagre pickings. 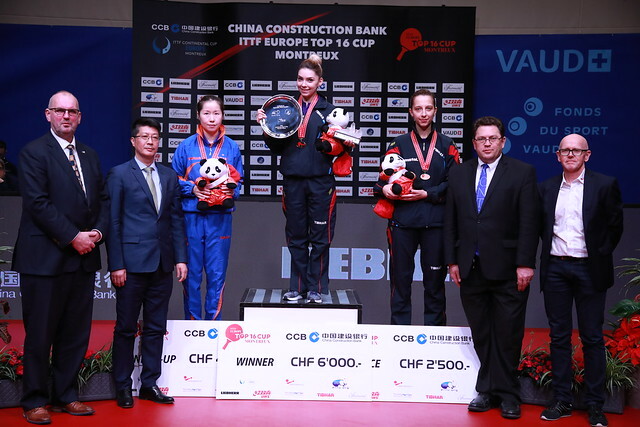 Like Chen Weixing in the age when the tournament was named the Europe Top 12; Germany’s Ebby Schöler finished in 10th place in 1972 in Zagreb and the following year in seventh spot in Böblingen. Soon after Hungary’s Janos Borzei made three appearances, ninth spot was his lot in 1974 in Trollhaten, 12th position in both Vienna the following year and in 1976 in Lübeck. Meanwhile, for the two remaining male defenders who have competed, Frenchman Christian Martin concluded matters in eighth position in 1978 in Prague, England’s Chen Xinhua in 11th spot in 1993 in Copenhagen. Few and far between, one wonders if it had been 16 players not 12 in the times of England’s Matthew Syed or Evgueni Chtchetinine of Belarus, would they have qualified? Even so, the numbers are small; in Montreux, Panagiotis Gionis and Ruwen Filus have very much broken the mould; Ruwen Filus is the no.6 seed, Panagiotis Gionis the no.14 seed.